Gamepad not working with Project 64 - help needed! 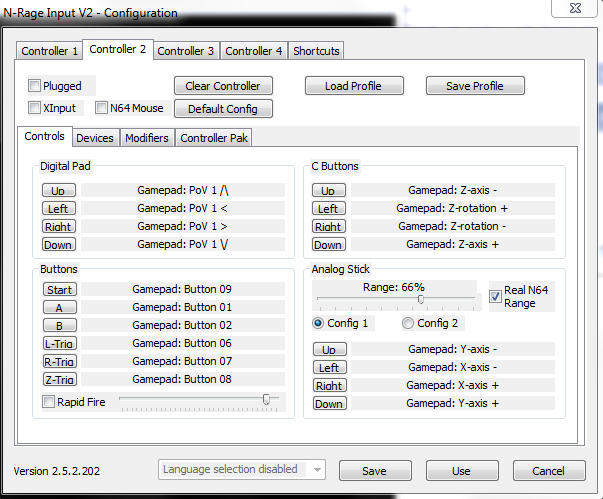 Hi, so I recently purchased a May Flash N64 adapter to play Super Mario 64 Maker and although when I go into the options-configure controller plugin and I then assign all the buttons and control stick successfully the actual game has no response. I tested the adapter with Mega Man Maker and it works fine with no issues so I get the feeling that i'm missing something with regards to project 64. What plugin are you using? What are your settings? Hi, by plugin I assume you mean the controller plugin for project 64? Is this what you were asking for? If not then let me know. Last edited by RetroStu; 28th October 2018 at 05:57 PM. just checked and they are both the same, what do you mean by plugged box? If you're talking about the adapter that the controller plugs into then there's nothing to check, i've tested the adapter with Megaman Maker and it works fine. There is clearly a "Plugged" box in the settings you have not checkmarked. Sorry I misread your post, it turns out that was the problem and now it's working fine with no issues, thanks so much for your help!!! !